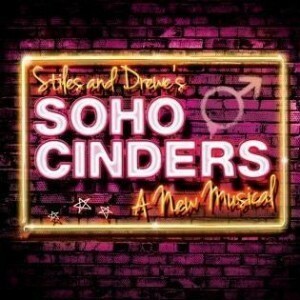 Soho Cinders is a piece of high-camp musical theatre which is at times fun and entertaining but sometimes borders on irritation with its tackier musical moments. George Stiles and Anthony Drewe are a long-term creative partnership with 29 years of collaboration under their belts. This latest does exactly what it says on the tin and sets the Cinderella story in contemporary Soho. Our Cinderella is a twenty-something rent boy called Robbie (Tom Milner) who gets wrapped up in an illicit affair with an aspiring politician called James Prince (Michael Xavier). The story intertwines elements of Cinderella with contemporary political scandal and an urban setting. Both Milner and Xavier put in strong performances but they are at times let down by the clunky and unoriginal musical numbers and uninspired scripting. Much of the light-relief is provided by the characters of Dana (Beverley Rudd) and Clodagh (Suzie Chard) who take on the role of the ugly sisters. Both of them are equally outrageous, fame obsessed and money grabbing. They provide a counterbalance to some of the other characters who are a little po-faced. Another notable performance is given by Amy Lennox who plays Velcro, a frizzy haired laundrette worker and best friend to Robbie. She is a likeable and fun character who saves some of the slower scenes. Narration to the unfolding events is provided by the recorded voice of Stephen Fry. His ever recognisable lugubrious tones are another plus point within the performance. But then again, many of us would be happy to listen to him reading extracts from the Yellow Pages. The show is well choreographed and makes brilliant use of the stage in the Soho Theatre’s main house. It’s just a shame that the overall effect is let down by some of the weaknesses in the script and the more crass and predictable musical numbers. One song features the repetitive refrain of “you shall go to the ball Cinderella” which goes on for far too long. There is enough within Soho Cinders to keep it entertaining despite its flaws. If you are going to go, just don’t expect anything particularly out of this world and you’ll be able to sit back and enjoy some of the stronger performances and the choreography. Soho Cinders is at Soho Theatre until 9 September, at 8pm. Tickets cost £12.50 - £37.50.